Columnist Myles Anderson shares key findings from a recent BrightLocal survey on the effects of age on consumption of online reviews. In BrightLocal’s recent Local Consumer Review Survey, we uncovered some important updated findings about consumer attitudes toward online reviews for local businesses. More consumers are now reading reviews as part of the purchase cycle. They are also reading reviews more frequently than in previous years, and they are forming opinions faster. So, yes — as many of us in the industry know, reviews and reputation are a key part of successfully converting consumers to customers. However, in order to give business owners and SEOs more precise and actionable insights so that they can apply this data to their own clients or business, we’ve looked again at the survey data and considered how consumers of different ages are influenced by online reviews. In the past year, 58 percent of consumers aged 18–34 have searched online for a local business at least one time per month. 43 percent of consumers aged 35–54 have searched online for a local business at least one time per month. 26 percent of consumers aged 55+ have searched online for a local business at least one time per month. Consumers aged 55+ are the least likely to search for local businesses online. Although 86 percent of them have done so at least once in the last 12 months, only 26 percent do so on a monthly basis. For younger consumers, finding a local business online is much more of a habit, and 58 percent of those aged 18–34 have done so at least once per month over the past year. For consumers aged 35–54, 43 percent have searched online for a local business at least once a month. 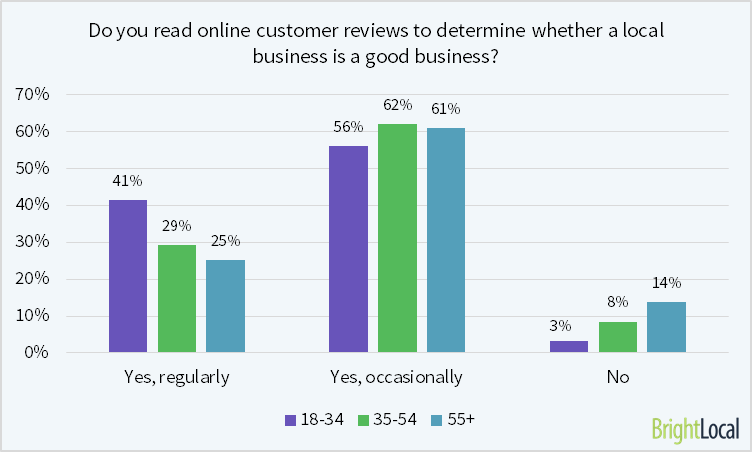 This doesn’t tell us anything about reviews specifically, but it does show that SEOs and business owners need to be aware that consumers of all ages are searching for their businesses online. 97 percent of consumers aged 18–34 read local business reviews online. 91 percent of consumers aged 35–54 read local business reviews online. 86 percent of consumers aged 55+ read local business reviews online. In this chart, we can see that the reach of online reviews extends broadly to consumers of all ages. However, younger consumers in particular are the more active readers. Forty-one percent of consumers aged 18–34 regularly read online reviews, versus 29 percent of those aged 34–54 and 25 percent of those aged 55+. A greater percentage of each age group would class themselves as “occasional” review readers rather than regular ones; still, over 85 percent of consumers of all ages state that they do read online reviews. Consumers may or may not invest much trust in online reviews (more on this later). However, with people of all ages searching for businesses online, available reviews — which are being read — will have at least some influence on consumers’ decision to use that business or not. 89 percent of consumers aged 18–34 trust reviews vs. 69 percent of consumers aged 55+. 31 percent of consumers aged 55+ do not trust reviews as much as personal recommendations. Outright trust of online reviews is low among all age groups. Not many consumers have outright trust in online reviews, but the younger the consumer, the more likely they are to trust a review. Conversely, it is those aged 55+ that have the lowest trust in online reviews and are the least likely age group to trust reviews as much as personal recommendations. Authenticity is the biggest caveat for consumer trust in online reviews, and it is particularly important for those aged 18–34 and 35–54. If authenticity can be established, then a third of these consumers are very willing to trust online reviews. For consumers aged 55+, there is a fairly equal spread of reasons not to trust reviews a much as personal recommendations. Authenticity and quantity of reviews, as well as the type of business that is being reviewed, all have an impact on consumer trust. *Respondents were asked to select as many answers as they wanted. The PC is still the most popular way for all consumers to read reviews. 62 percent of 18–34-year-olds have read reviews on a mobile device. Older consumers (55+) significantly prefer PC over mobile/tablet devices. Most consumers have read online reviews on a PC, and it’s still the most popular way of doing so. Consumers aged 18–24, however, are more likely to read reviews on other devices. Sixty-two percent of young consumers have read reviews on a browser on their phone (mobile internet), while 40 percent have read them on a tablet or on a mobile app. Consumers aged 55+ obviously feel more comfortable with reading reviews on a PC, and businesses who are targeting this age group should be aware of the level of visibility this offers across different review sites.